I have never dropped a call with the Element Case nor have I had problems making a call with the case on. But, that's probably because I live in Honolulu and other places with a less strong signal may be affected. After my initial signal test, I took the case off and put it back on carefully. I did more signal tests and I got results closer to -84 dB, which is much better than the initial -110 dB I was getting. After getting an e-mail response from Element Case, it seems that you can put the case on "wrong." 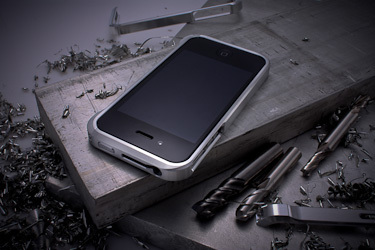 If any part of the case is touching the metal antenna of the iPhone 4, then you will have signal issues. I heard that Element Case put more insulation pads inside of the case since the first batch went out. But, for the price I'm paying the entire inside of the case should be lined to insulate it from the antenna. Putting the case on is a crapshoot and if you put it on "wrong" your iPhone 4 will be severely compromised. For that, I cannot heartily recommend the Element Case Vapor. Any of them. The one problem I have consistently had with the Vapor case is the GPS. If your GPS use is mostly Gowalla or Foursquare you shouldn't have problems. Finding yourself in Maps should also be okay. But, it seems enough of the GPS signal is blocked so that you cannot get a precise location or compass bearing when using turn-by-turn navigation apps. For this reason, I am not using the case everyday. Also, at least for the 007, it is very easy to scratch up. I take great pains to protect my iPhone 4 and I have not dropped it since I put it in the Vapor 007. So, the only way that the 007 is getting scratched up is when I lay it on a table or pick it up from a table. I guess any metal is quite easy to scratch but the 007 is so lustrous that the scratches are much more noticeable. I know Element Case went through a lot of work to make the Vapor line of cases much less bulky than the Liquid cases. But, I'd take the bulkiness (and I did for a long time) over a case that is nice-looking but could affect your phone use. Wish I would have found this before purchasing the Element AR15 case for $109. I am having the same GPS issue with my iPhone 4. GPS works perfect without the Element case. After putting the Element case on I sporadic GPS reception.